Ján Kubiš, Special Representative the Secretary-General and Head of the UN Assistance Mission for Iraq (UNAMI), briefs the Security Council. Recent victories against ISIL show that Iraqis are capable of defeating the extremist group, but sustainable peace and security in Iraq can only be achieved through historic reconciliation, the United Nations envoy for the country today said, calling also on the international community for greater support for Iraq and its people. “The need for Iraqi political and community leaders and in particular the Council of Representatives to prioritize reconciliation based on a single vision and coordinated approach remains a matter of considerable urgency to ensure that the post-Da’esh phase in Iraq’s history be more stable, secure and prosperous than in the past,” said Ján Kubiš, the Special Representative of the Secretary-General for Iraq, using the Arabic name for ISIL. Mr. Kubiš said that progress against ISIL puts the liberation of Mosul “strongly on the agenda.” As those preparations continue, Prime Minister Abadi has prioritized UN-supported humanitarian operations and has requested the international community to urgently provide the necessary financing, he said. Along with military plans, the Iraqi Government and local actors must accelerate political planning for “the day after” the liberation, addressing issues of governance, law and order, and political management of Mosul and the rest of Ninewah. That includes reforming Iraqi security institutions and ensuring the State has full control of armed groups, he said. “I continue to call on the Government to also take specific steps to promote women’s rights, their participation in politics and national reconciliation processes as part of the reform process as well as to support the victims of conflict-based sexual violence more effectively,” he added. In addition to the political situation, the Special Representative highlighted concerns over human rights violations in Iraq. These include concerns for more than 700 Iraqi men and boys who remain missing following the Falluja military operations on 22 May. UNAMI has also received credible reports of torture and killings, disappearances and other allegations of mistreatment of those detained, committed by elements of the popular mobilization forces and the Iraqi security forces operating in the Fallujah area, notably during the initial phases of the operation. For example, UNAMI has registered statements supporting claims that 95 men remain unaccounted for after they were intercepted by forces affiliated to the Popular Mobilization Forces (PMF) while leaving their homes in Al Sejar area on 25 May, while another 643 men, including boys, remain missing since 5 June after they were intercepted by PMF-affiliated forces while leaving Saqlawiyah, the Special Representative said. Mr. Kubiš noted that, in a meeting with Mr. Abadi this past Monday, he had reiterated a message from Secretary-General Ban Ki-moon that it is imperative for the Prime Minister to establish a committee to investigate violations and crimes quickly identifies the whereabouts of the missing men and boys, and secure their safe release or transfer to lawful government authorities. Meanwhile, as the Da’esh’s governance project in Iraq is collapsing, it has increasingly resorted to brutal insurgency tactics using suicide bombers. “The pattern of reinvigorated urban terrorism with sectarian focus, notably attacks against civilian targets and infrastructure in Baghdad is indicative of this trend. Luckily, so far they have failed in their efforts to re-ignite sectarian confrontation,” he said. The UN envoy also emphasized that the humanitarian situation in Iraq has deteriorated further since the start of the military operation for Fallujah, with 640,000 people currently displaced in Anbar governorate alone. Nationwide, more than 10 million Iraqis require some form of humanitarian assistance, including 3.4 million people who have been displaced since the rise of ISIL in 2014, he said. Noting that the humanitarian appeal for 2016 requested $861 million, the Special Representative stressed that it is only funded at 38 per cent. “A reallocation of existing resources is under way but more funding is urgently needed, not only for the current emergency response, but also for the anticipated requirements arising from the Mosul liberation campaign, where the humanitarian effort could cost as much as $1 billion,” Mr. Kubiš said. The Mosul operation could be the largest and most sensitive humanitarian crisis in the world in 2016, the Special Representative said citing the UN Office for the Coordination of Humanitarian Affairs (OCHA) and urging that resources be made available now to make timely preparations possible. “The impact of under-funding on the crisis in Iraq is significant. Patience of host communities is disappearing, distrust in the government is growing. Prospects for stability and reconciliation after ISIL are put at risk,” he added. The envoy said that UN efforts to help stabilize areas newly liberated from ISIL are expanding, including Ramadi and soon also Fallujah. However, he said that stabilization efforts can only expand further after the threat of improvised explosive devices and explosive remnants of war has been addressed. For its part, UNMAS is working in Iraq with partners to address explosive contamination, which requires $300 million minimum financing over the next three years. “The world must recognize that Iraq requires more, not less international support at this critical juncture,” Mr. Kubiš said, adding that the pledging conference organized in support of Iraq in Washington, D.C., on 20 July is a sign of the international community’s continued commitment for a stable and peaceful Iraq. “While the international community is ready to offer assistance, Iraqis must implement substantive, in particular economic, institutional and anti-corruption reforms that will put their country on the road to recovery and improve the lives of Iraqis. People demand genuine change,” he concluded. 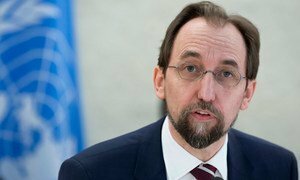 The United Nations human rights chief today deplored the terrorist bombing in Baghdad on Sunday that reportedly killed more than 150 people, calling on Iraqi authorities to do more to protect civilians as well as halt uncontrolled militias from continuing to take revenge on civilians fleeing towns recaptured from the Islamic State in Iraq and the Levant (ISIL/Da'esh).